The digital days are upon us and deciding what to do about the IoT is a decision that will make or break companies in every industry, including the IoT vendors themselves. This article provides a simplified approach to understanding what an IoT Platform is, the benefits of having one, and how to choose the right one for your business. Now that we know what an IoT platform does, let’s look at the different ways in which an IoT platform can be employed in the IoT technology stack. A platform specialized in providing Connectivity to the Internet of Things is focused on providing the infrastructure of communication between the device and the cloud (Hologram, Cisco Jasper, Sigfox). Cloud providers like AWS and Google focus on providing storage and analytical services for the IoT that make drawing insights from data and developing applications possible. Built to provide analytics-as-a-service, Data platforms like the Accenture Insights Platform power the analysis and AI component needed to understand, use and scale growing amounts of data. And finally, truly End to end IoT Platforms provide all of the above, and some extras. In addition to hardware, connectivity infrastructure, cloud services and analytics; developer tools and connected services like real-time alerts and notifications are included too. 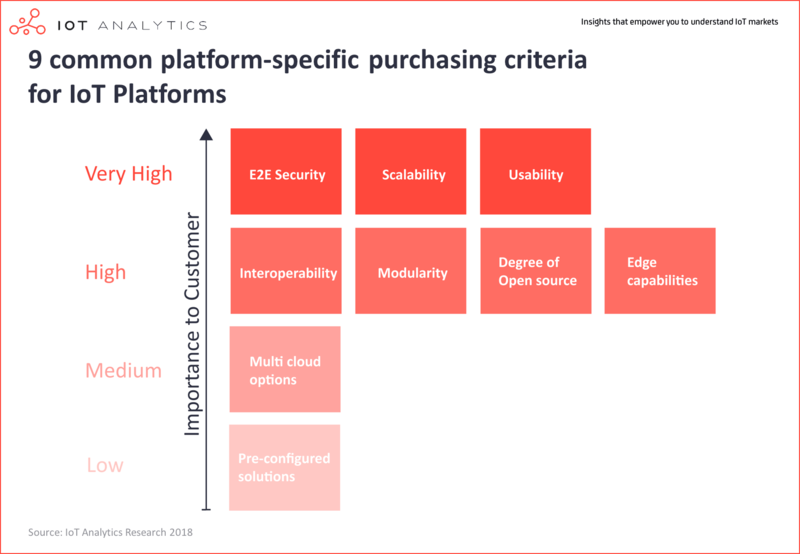 End to end platforms are great for companies who do not possess the necessary investment, resources or expertise required to partially build their own platform. This is likely the fastest growing segment of IoT platforms and for good reason: providing the entire IoT technology stack in a world going digital represents massive market and financial gains. As the most interesting segment of IoT platforms to watch, I’d like to expand on the value and capabilities an end to end IoT Platform should deliver. It’s ethos. The evolution of the IoT is such that at present, there are still hundreds of platforms vying for relevance today for the future. But with Cloud Service Providers (CSPs) like AWS, Microsoft, and IBM gradually advancing their offerings into the end to end spectrum, smaller providers will have a difficult time competing without being settled in a niche or finely differentiated. Another distinction worth making is the terms “platform” and “application”. An application can be a component of the platform or a standalone piece of software, that, as we saw above, uses data to create business value. Without an application, the platform facilitates the collection and storage of data with no sense of direction. It would be like launching a spacecraft with no mission. The application is the mission directive and the platform the vehicle for achieving it. Using the same logic, a mission with no spacecraft may be possible in narrow instances, but by no accounts can be a sustainable digital strategy. It may sound like we are implying a platform is only as good as the applications it runs. Which would suggest that all spaceships are created equal. But as we observed in the previous section, that is not the case. The takeaway here is choosing a good IoT platform is prerequisite to running a good application. A good platform will be flexible and capable to run any application you may require. It’s worth noting that good IoT platforms will have a strong ecosystem of partners and customers, referenceable success stories in your industry, and be aligned with your digital strategy. Therefore, selecting the right one is a matter of having a clear digital strategy, identifying the platforms that may be aligned with it, and testing their offering. Here’s a useful resource from IoT Analytics. They found 17 commonly used selection criteria among companies choosing an IoT platform provider. They categorized these criteria into “customer” and “platform” specific. Ranking these criteria by importance, you can get a sense for how other companies approach the challenge of comparing and selecting platforms. After you have made your list, discuss it over among your organization’s stakeholders, particularly those in departments the solutions will be deployed. Then create your shortlist of providers you would like to engage with during a proof of concept / pilot, and engage. This February, during the Mobile World Congress, we’re launching our end-to-end IoT Platform for safety & security and efficiency & controlling applications. If you’re at MWC, too, schedule a meeting and let’s discuss how it can drive business outcomes for you. Otherwise, contact us and we’ll show you an online demo of the Platform.